On the first trip to study great white sharks in the wild off Guadalupe Island in 2013, the REMUS SharkCam team returned with an autonomous underwater vehicle (AUV) tattooed with bite marks and some of the most dramatic footage ever seen on Discovery Channel’s Shark Week: large great white sharks attacking the underwater robot, revealing previously unknown details about strategies sharks use to hunt and interact with their prey at depth. The team returned to Guadalupe Island in December 2015, with two REMUS SharkCam AUVs and captured spectacular never-before-seen imagery of shark behaviors. Their findings will be shown on Discovery Channel as part of this summer’s Shark Week programming. A team from WHOI including Kukulya and WHOI engineer and SharkCam software developer Roger Stokey traveled to the remote island 150 miles off the West Coast of Mexico, where hundreds of great whites visit each fall and winter. The reasons for their visit have mostly remained a mystery before the use of REMUS SharkCam. There, they teamed up with biologists Greg Skomal of the Massachusetts Division of Marine Fisheries, and Edgar Mauricio Hoyos Padillao of Pelagios-Kakunjá, a Mexican marine conservation organization. Their mission was to tag, follow and film great whites farther into the deep and into the night. 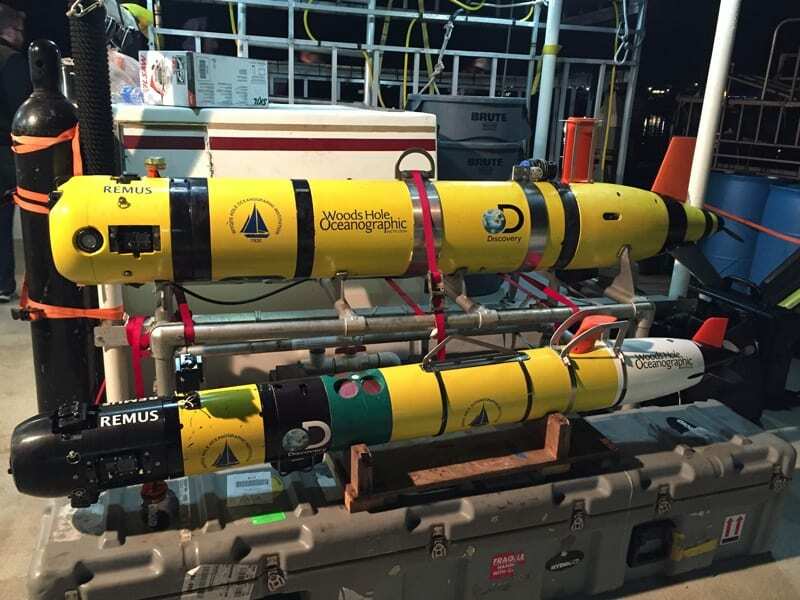 This time the research team was equipped with two REMUS SharkCam AUVs—the original vehicle that can go to 100 meters depth (328 feet) and a larger version that can track sharks to 600 meters (1968.5 feet). The program featuring the expedition debuts as part of Shark Week 2016 on the Discovery Channel. Viewers can tune in to “Jaws of the Deep” on June 27 at 9 pm EDT to find out what new secrets were revealed by the REMUS SharkCams. Learn about the behavior of white sharks as they swim on their deepest dives to over 200 meters (700 feet) and swim into the night. Scientists know astonishingly little about the simplest of great white behavior, let alone where the ocean’s top predators migrate, mate, or give birth. Until recent technological developments, researchers were limited in their ability to observe great white sharks in their natural habitat. A team at the Oceanographic Systems Laboratory (OSL) at WHOI developed REMUS SharkCam in 2011 and tagged its first shark, a basking shark (Cetorhinus maximus) with funding from the Discovery Channel. It’s the first underwater robot capable of tracking and filming sharks and other marine animals up close in the wild in three-dimensional space. One of the biggest challenges in designing a vehicle that could track a randomly, fast-moving animal, like a shark, was the navigational system. Unfortunately, GPS and radio waves don’t work underwater, so engineers had to develop their own communication system using sound. First a shark is tagged with a transponder, which communicates with the AUV. A transducer on REMUS SharkCam sends out an audible ping, and every few seconds, it gets a reply back from the transponder attached to the animal. The vehicle also uses an array of four hydrophones that help it determine the direction of the response from the transponder. REMUS SharkCam is able to do that with a clever combination of hardware and software that work together to track the tagged animal. The engineers based the vehicle’s tracking system on what they’ve learned from how marine mammals, such as dolphins, communicate— with a series of clicks. When the transponder on the shark replies to the vehicle, it actually sends two replies or clicks, which help the vehicle determine distance, direction and depth. “The second ping that comes from the transponder is slightly delayed, allowing the vehicle to figure out depth of the animal by doing a little on-board math,” Kukulya said. The robot’s software algorithm, which is based on data of known shark behaviors, also helps predict where the shark is going to be. REMUS SharkCam stays at a pre-determined standoff distance and position as it captures the shark’s movements on video, as the animal interacts with its environment. The vehicle communicates with scientists on the surface every 10 to 20 seconds. It can also accept commands from the surface to change relative speed, depth, and standoff distances with respect to the animals. The innovative technology was first tested off the coast of Cape Cod in 2012 with basking sharks and then with great whites. Using similar technology, WHOI engineers developed a new vehicle called TurtleCam, which will be used this summer to tag and investigate the behaviors of endangered Leatherback sea turtles off the coast of Cape Cod. 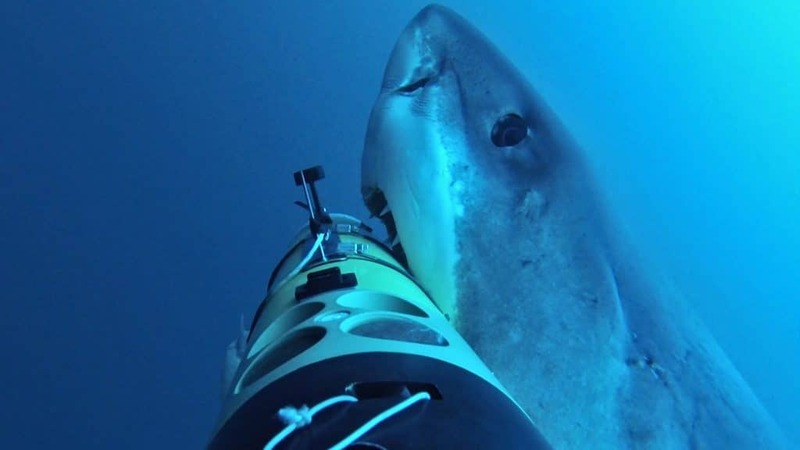 On the first trip to study great white sharks in the wild off Guadalupe Island in 2013, the REMUS SharkCam team returned with an autonomous underwater vehicle (AUV) tattooed with bite marks and some of the most dramatic footage ever seen on Discovery Channel's Shark Week. 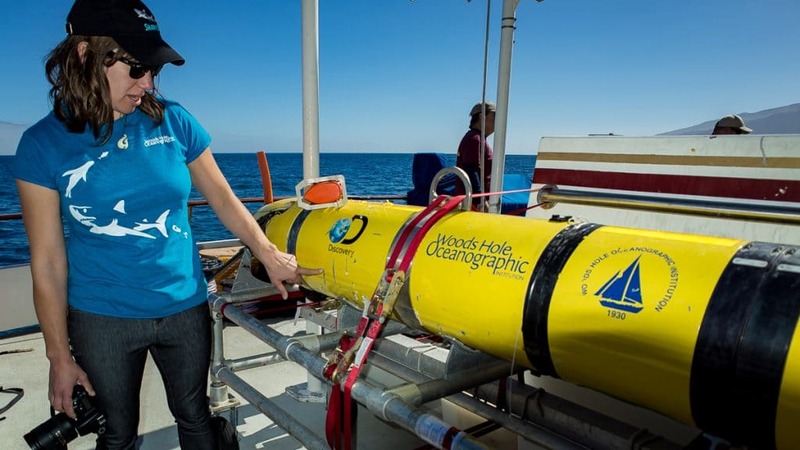 When the research team returned to Guadalupe Island in December 2015, they brought two REMUS SharkCam AUVs—the original vehicle that can go to 100 meters depth (328 feet) and a larger version that can track sharks to 600 meters (1968.5 feet). WHOI engineer Amy Kukulya, one of REMUS SharkCam's principal investigators, points out clearly visible bite marks on the larger vehicle.